Urgot finally met his end at what should have been his finest hour. Because of his military background, he often accompanied detachments into foreign territory to carry out judgment. After ambushing an enemy force, Jarvan IV, Crown Prince of Demacia, fell into the clutches of Urgot's division. Too far from Noxus to risk transporting their prize for ransom, Urgot prepared to dispose of their captive. At the final moment, however, the Dauntless Vanguard, led by Garen, the Might of Demacia, intervened, and Urgot was cut in two by the zealous warrior as he scrambled to free his Prince. In recognition of his service, the executioner's remains were remanded to the Bleak Academy for reanimation. A lifetime of abuse, however, had left his body in a catastrophic state; proving problematic to the necromancers' craft. Professor Stanwick Pididly, the prevailing scholar of Zaun, offered a solution. Within Pididly's laboratories, a nightmarish new body was forged for Urgot. 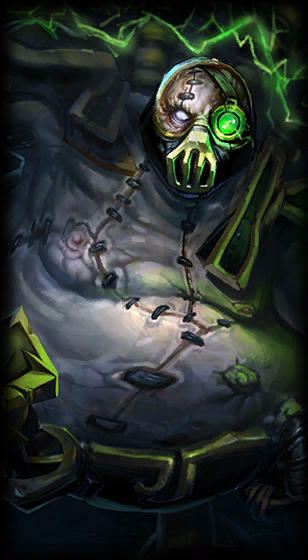 Now as much machine as man, Urgot arrived at the League of Legends in search of the man who ended his life; necromantic energies coursing through his metal veins. * Keep moving to avoid being hit by Urgot's Noxian Corrosive Charge. If you are afflicted by his corrosive charge, quickly move out of range of avoid his Acid Hunter Missiles. * Urgot deals more damage when his Terror Capacitor is active. Quickly break the shield from his Terror Capacitor to reduce the damage he deals. Urgot's attacks reduce his targets' damage by 15% for 2.5 seconds. Cool champ in my opinion, even if he's very difficult to play because of the many skillshots.